Quemard will be responsible for developing modular production at PSA. 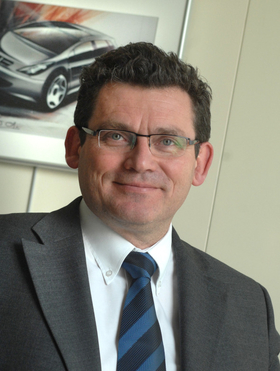 PSA/Peugeot-Citroen CEO Philippe Varin has created a new department and given two senior executives fresh roles to improve efficiency in the automaker's technical and industrial operations. Jean-Christophe Quemard is promoted from head of purchasing to head of programs, effective September 1. In his new role Quemard will be responsible for developing modular production and industrial operations strategies as well as defining and implementing vehicle and subassembly programs for the Peugeot and Citroen brands. A key task facing, Quemard, 50, will be to increase parts carried over into new cars from old models to 50 percent from the current 30 percent by 2012 to help reduce the cost of investments and production. The target was unveiled in November when PSA presented its three-year strategic plan. Quemard's experience as the automaker's purchasing boss also will help to reduce the number of suppliers providing components for future models. PSA's strategic plan says the automaker aims to source 50 percent of components in its new models from its top suppliers by 2012, compared with 25 percent last year. Also effective September 1, PSA will have a new industrial operations department led by Denis Martin, the company's current personnel chief. The department will run PSA's European manufacturing and the company's global supply chain. The task for Martin, 53, will be to implement the strategic plan goal to increase capacity utilization in Europe to 105 percent by 2012 from 80 percent last year. The figures are based on the metric used in the Harbour Report on automotive manufacturing, which calculates a plant's capacity based on two production shifts a day for 235 days a year. Half of the productivity gains Martin has to deliver will come from downsizing PSA factories in France such as Aulnay, which builds Citroen C3, and Rennes, where the Citroen C5 and Peugeot 407 are produced. Martin's department is also tasked with reducing the time the company needs to build a car by 20 percent. The reduction will also be achieved by cutting by 30 percent the technical diversity between different models built in the same plant. Yannick Bezard will take Quemard's role as PSA purchasing chief. Bezard, 49, currently is the company's head of engineering, platforms and purchasing for Latin America. Claude Brunet will replace Martin as head of human resources and quality. Brunet, 53, was head of Ford Motor Co. in France from 1996 to 2001 and will join PSA from the French insurance group AXA, where he was human resources chief. Guillaume Faury will run PSA's r&d department, which will be expanded to include styling, projects and engineering operations. Faury, 42, joined PSA in 2009 from Eurocopter to head manufacturing and components.